The Signature necklace is the best way to show how individual you are. It is just like it says "signature". 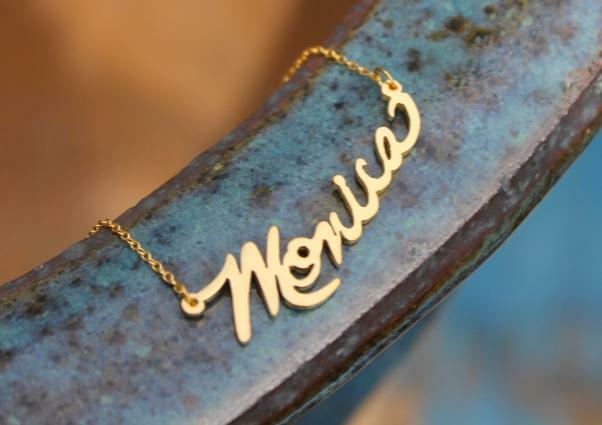 We can recreate a personalized necklace just for you in you own handwriting. All you need to do is snap a photo of your handwriting and send it to us. 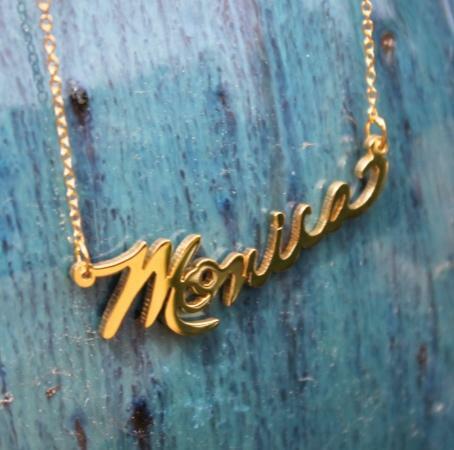 We then handcut a necklace to recreate you handwritten word or words. How cool is this! Here you see that I have written my name on a sheet of paper then I took the image with my phone. That easy. Each necklace text will be about 3/8" tall and names length will vary due to number of characters. Since this is so custom we suggest just one word. If you think you will need more text please email us at Quotes for additional charges. My necklace is done in gold plated on a 16 inch length chain. Perfect for a child's handwriting for mom for Mother's Day. Write "I love you" for a special someone to wear everyday. The possibilities are endless. Please allow about 2 weeks for us to complete this process. If you have problems uploading you image just email it to us after you place the order. email it to orders@thepinkmonogram.com We will confirm we have gotten the image. We can create this necklace in either sterling silver, gold plated or rose gold plated and upgraded 10 karat solid gold. Price: $94.00 In stock! - Browse this brandOur products are custom made to your specifications. This product ships up to 3 weeks after your order is placed. Choose your metal choice for you Signature Necklace.